May is National Bike Month, established in 1956 and sponsored by the League of American Bicyclists, when many events are offered to showcase the benefits of biking. 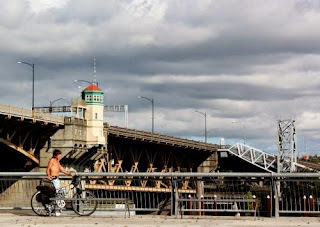 Bike to Work Week runs from May 11 to May 5, 2015, with Bike to Work Day on May 15 to highlight that biking is a viable transportation alternative. Postcard US-1996944 to Germany shows a biker in Portland, Oregon, the most walking, biking, and public transit friendly city on the West Coast, according to Walk Score. Minneapolis, MN (Bike Score: 81.3), San Francisco, CA (Bike Score: 75.1); Portland, OR (Bike Score: 72.0); Denver, CO (Bike Score: 71.3); and Boston, MA (Bike Score: 70.3) are the top five most bike friendly cities in the U.S. In comparison, Las Vegas is unfortunately a car-dependent city, ranked 29th (Bike Score: 52.0) among the cities with 300,000 residents or more. An article from the Las Vegas Review Journal has listed 6 scariest things about riding a bike in Las Vegas.